Our factory was certified by GOTS 4.0, Which has an organic fabric exhibition hall of 400 square meters. We have ability of development and design, developing more than 30 kinds of new fabrics every month. Normal organic fabrics have greige in stock. Shaoxing Ecou Textile Co.,Ltd was founded in 2009 ,which has been committed to the development of eco-friendly fabrics. The company has mature technology and rich experience in this field, the rigorous quality control covers from raw material to finished fabric and the stable quality is in accordance with Ecou adhere to its product concept. And we provide customers with customized services with low MOQ. Ecou has been certificated by the international organic certification body ECOCERT and issued GOTS & OCS organic certification. The company's organic products are produced in accordance with the GOTS & OEKO-TEX100 standard. In order to faster establish trust on the Internet with the foreign customers, we have been in cooperation with the BV &Intertek Certified Company and have passed the certification audit and been issued a certificate. In the field of fabric dyeing and printing, with many years of experience in exporting to Europe and America, we have a systematic process as to the control and management the whole project. We have extremely strong advantage over the good quality and delivery time,especially in the range of organic products we have perfect supporting, which has a strong plus. Ecou has shares in supporting enterprises like theTeXie textile processing factory, as well as Shaoxing organic knitting factory. "steady quality, reasonable prices, satisfactory service,and prompt Lead Time". Ecou Textile is always focused on research, development and innovation. And provided with experienced technicist and manager, established own Research and Development workroom. we can customize products according to your description or special requirement. OEM/ODM. Aimed at organic betters our life,we are committed to manufacturing and selling of eco-friendly fabrics. 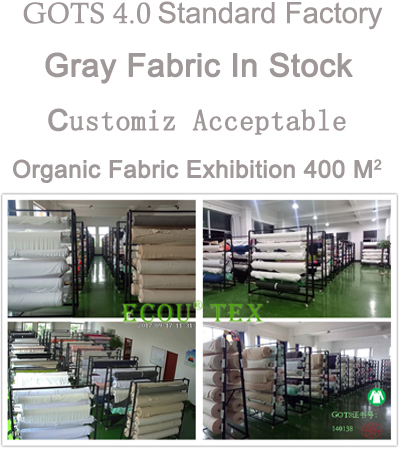 For customers' purchase convenience, we have been keeping stock for conventional varieties of greige fabric and finished products all year round.We warmly welcome regular and new customers come to choosing and ordering. 400 square meter room for organic fabric. 2018 Texworld New York.NO. : 1D-F44, Jan 22-24th 2018.